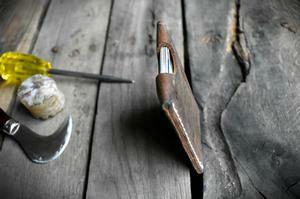 This product is made by our son Jacob Leahy, in his shop in Alaska. 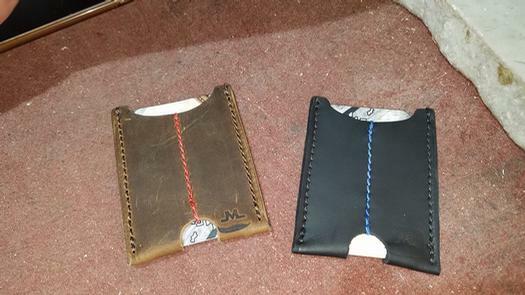 His company is called JML Leatherworks and he makes this minimalist wallet for those who agree, that less is more. Stack up to 10 cards in this slim, single pocket cowskin, and use the slot at the bottom to retrieve ‘em quick. 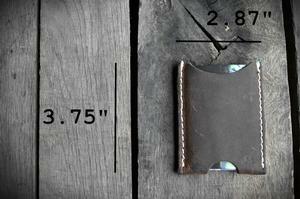 Over time you’ll be able to fit even more cards in this little wallet meant for the front pocket. Front pocket carry is one of the most secure ways to carry a little cash and a lot of cards. Keep those pickpocketers away from your goods with our slim, minimal pocket wallet. This wallet is available in all three of Simply Rugged's color choices: Tan, Black and Oxblood and includes simplyrugged.com branded on the front.